As well as heat exhaustion, this weather can also be dangerous to your pet’s paws. The pavement outside can get extremely hot in this summer heat. If you went outside without sandals or shoes, you would find that you wouldn’t be able to walk far before burning the bottoms of your feet. Although your dog’s feet are tougher than yours, they can burn on hot pavement, too. An example of happy, healthy footpads. Diesel modelling his Muttluks to protect his footpads on the hot pavement (oops, it looks like we lost one bootie on the way out the door for the photo shoot!). If your dog has burned their footpads, flush the paws with cool water immediately and gently dry the area with a soft towel. Your dog should see their veterinarian to determine if pain medication or antibiotics are needed. Use a bandage, sock or special shoe to keep the paws clean, dry and comfortable until the affected pad areas have healed. If it is too hot for your bare feet out there, it is also too hot for your dog’s paws! Any cat owner out there knows that there is a point in time where they will get the pleasure of shockingly stepping onto a gooey, slimy and squishy (and usually cold by the time your foot finds it!) hairball on the floor at home. Not only are hairballs unpleasant for owners to clean up, but they can also be harmful to your cat if they aren’t vomited back up. Hairballs moving through the digestive tract can sometimes cause a lack of appetite, lethargy, constipation, diarrhea or even intestinal blockages. When your cat works on the task of grooming, their loose and dead hair catches on the hooks on their tongue and then gets swallowed. A majority of this hair is able to pass through the digestive tract without issue. Sometimes though, some of the hair remains in the stomach and forms a hairball. In an ideal world, your cat will vomit the hairball on an easy to clean surface in an area that you won’t step on it with your bare feet. In the real world… it doesn’t always go that way! What can you do to help keep your cat’s hairballs to a minimum? Groom your cat regularly. The more grooming work you do for them, the less they will have to do themselves. Grooming also allows time for you and your cat to bond. Feed your cat a diet that promotes healthy skin and hair coats. These diets will minimize the amount of shedding your cat does. Discourage excessive and compulsive grooming. Cats that are bored may turn to grooming as an activity to pass time. Find some fun toys that your cat will enjoy playing with. Give an anti-hairball or laxative product to your cat. There are many products available which help promote hairball movement through your cat’s digestive tract. Some cats need to be given these supplements once weekly. This extremely long hairball came out of our clinic cat, Celine! Celine enjoys relaxing in the blanket baskets while watching us all hard at work. Exciting news! We now offer a variety of regenerative medicine options for your dogs experiencing painful or restricted movement throughout their day-to-day lives. These procedures are still quite new, but have already been showing positive changes and results with our patients who have undergone treatment. Platelet rich plasma and stem cell therapy can be used to reduce pain and inflammation in arthritic or otherwise injured joints or to help heal damaged muscle, ligaments, and tendons. It is amazing to see how far veterinary medicine has come. Platelet Rich Plasma (PRP): A sufficient volume of blood is collected from the patient and the platelet fraction (high in growth factors and molecules to help facilitate reduction of inflammation) is harvested and injected into the affected joint(s). PRP provides pain relief for arthritic joints for as long as 9 months. It is a mildly invasive procedure. Stem Cell Therapy: Stem cells are harvested from bone marrow or fat tissue of the patient. Stem cells have the ability to repair any type of tissue they introduced into. Stem cells work more efficiently when combined with PRP. Stem cells have the ability to regenerate damaged tendons and ligaments. This therapy can provide pain relief for as long as 11 months. It is a moderately invasive procedure. One of our staff pets, a 7-year-old spayed female Siberian Husky, underwent PRP injections into her hips today. Her name is Maquita. She has had a history of hind end lameness after exercise. Radiographs revealed she does have arthritis developing in her left and right hip joints. She has had multiple chiropractic and acupuncture treatments in the past, which did help alleviate the pain and inflammation but did not help to facilitate long-term arthritis relief. She also needed to be given an oral anti-inflammatory medication as needed to help control the pain. We are excited to watch the progress of her recovery after her PRP therapy. Click here for more information about veterinary regenerative medicine. Maquita recovering nicely after undergoing PRP injection therapy into her left and right hip joints. 1. Walking your dog can strengthen the bond between you both. Daily walks build a fun and trusting relationship. It gives you and your dog time to work on behavioral development, making them the perfect dog all around. A nice walk around the Brohm Lake loop in Squamish. 2. Walking your dog can encourage socialization. Along the way, you will run into many other dogs and owners out there. Exposing your dog to other dogs and humans will help in the future to adapt faster in new or intimidating situations. Exploring the trails in the Smoke Bluffs area in Squamish. Little dog chasing big dog – very entertaining! 3. Walking your dog can promote weight control and digestive health. It is not healthy for your dog to be overweight. It is hard on their joints, as well as their internal organs. Daily walks stimulate your dog’s digestive system to stay in proper working order. 4. Walking your dog can help diminish destructive behavior and unwanted hyperactivity. Your dog enjoys having a task to complete or participate in. Going for a walk will not only tire them out, but will also give them a sense of accomplishment. Burning as much energy as possible. These little dogs feel so accomplished after every walk. 5. Walking your dog can boost your health. Spending time outside can boost your overall well-being. Having your dog as a fun exercise partner can help lower your blood pressure, help you shed a few pounds, help strengthen your muscles and put a big smile on your face! A little kiss to say thank you for the fun walk! Enjoying the sand at Nexen beach, downtown Squamish. Have you recently been for a walk around the Four Lakes trail in Squamish, B.C.? Have you noticed the “Toad Alley” sign, just before coming to the trail to Edith Lake? This area is a perfect breeding ground for Western Toads. It provides the toads with a perfect wet and forested environment. In this little area, there were hundreds of eggs, tadpoles and toadlets. They camouflage well into the dirt and mud so you really have to stop and focus your eyes – then you notice the whole area is crawling with life! Adult Western Toads range in colour from pale green to gray, dark brown and even red. They often have pale coloured bellies and a pale stripe down their backs. These toads have gold-flecked eyes and horizontal oval pupils. The males are generally smaller than the females. Western Toad eggs look like small black pearls. The tadpoles hatch from the eggs and are black or dark gray in colour. The tadpoles metamorphose into toadlets that look like miniature adult toads (they are actually kind of cute!). Their diet consists of a variety of insects and invertebrates. Look at this large pile of eggs and tadpoles! An island full of toad lets! Shall we make a guess on how many are in this one small area? Western Toads are protected under the B.C. Wildlife Act. It is important to continue researching these toads to identify their breeding sites and assess habitat requirements to protect the species. There are programs set in place to help track the Western Toad population. For more information, please visit the B.C. Frogwatch Program website. In the meantime, take a little walk around the Four Lakes trail and be on the lookout for toads! Can you spot the toadlet? As well as a tag on your pet’s collar with their name and your contact information, it is recommended that your pet also have a microchip. Microchips provide a permanent tamper proof method of identification for your pet. It will not fade over time or become illegible as can occur with a tattoo and it won’t fall off like an ID tag potentially could. A microchip can be the life saving connection between you and your lost pet. They are implanted between the shoulder blades. They can sometimes migrate down the shoulders or up around the neck area, but all kennel staff, veterinary staff, shelter staff and animal control staff are trained and equipped to scan all areas of animals found. There are many different styles of microchip readers available. Most are able to scan any type of universal microchip. A microchip reader is waved over the animal until the unique microchip number appears on the screen. This unique number can then be searched on a database and the pet’s owner contact information can be found. The lost pet can then be returned safe and sound. A microchip is no bigger in size than a grain of rice. It is made of a material that will not be rejected by your pet’s body and will not irritate your pet at all. It is implanted below the skin using a large gauge needle. It is a quick process and can be done on your pet while they are awake or while they are having an anesthetic or sedation for surgery or other treatments. It doesn’t hurt much more than having a vaccine administered. Each microchip comes in its own sterile packaging. To make this microchip blog more exciting, below are some photos of X-rays of animals with microchips implanted. Can you see them? Hmm, what is that bright white object above the spine? Occasionally, a microchip may migrate down to the shoulder blade area. Can you spot the microchip? A bike can excite some dogs and terrify others. Some dogs will gladly run alongside a bike while others would like to viciously destroy the bike until it can’t move anymore. And then there are the other dogs that are nervous and confused about the bike so they choose to run away from it in the opposite direction. Having a fear of bikes can be dangerous for the dog and the bike rider. Often when a dog tries to attack a moving bike, they can end up getting hurt or the rider of the bike may end up crashing (which can lead to terrible injuries!). Sometimes the rider of the bike may even get nipped at or bitten by the fearful dog. It is a good idea to train your dog to be comfortable around bikes, especially in our town of Squamish, where there seem to be just as many bikes around as vehicles. Introduce your dog to a bike that isn’t moving and watch their reaction– then you will know how much training work you have ahead of you. Get your dog to practice sitting and staying next to the bike. Reward your dog with treats or their favourite toy. Mischa is sitting in front of the bike but is still quite unsure about being so close to it. Mischa focusing on Montana while being offered a treat for calmly sitting near the bike. Next, have someone slowly ride the bike around while your dog is on leash. Have them ride on the other side of the yard or street. Continue to practice obedience (sitting and staying) around the slow moving bike. Pretend that you don’t even notice the bike. Work on keeping your dog’s attention and reward calm behaviour with treats or their favourite toy. Mischa paying close attention to Montana while they both try and ignore Robyn on the bike. Robyn on the bike goes unnoticed again! Mischa peeking out the corner of her eye at Robyn riding the bike while Montana tries to keep her attention. Once your dog is ok with the idea of a slow moving bike, practice walking your dog on leash in one hand while pushing the bike around with your other hand. Go at a slow pace and teach your dog that there is no reason to be scared of bikes. Reward your dog with food or their favourite toy when they are calm and relaxed around the moving bike. Montana keeping herself between Mischa and the moving bike. Mischa is staying calm. When your dog becomes ok with the idea of a bike in motion, keep them on leash and have somebody ride by at a faster pace. Once your dog is able to ignore the bike, have them increase their biking speed. Your dog may be ok with the bike at a slow speed but may become agitated when the bike goes speeding by. Continue to reward calm behaviour with treats or their favourite toy. Robyn coming up faster and closer to Mischa and Montana on her bike. Montana is ignoring the bike and making sure Mischa remains comfortable and calm. Mischa getting a little nervous about the bike but Montana is keeping calm and attempting to regain Mischa’s attention. After many “ride-by” practice drills, Mischa becomes more and more comfortable with the bike passing by. Purposely walk by strangers on bikes. Continue walking while keeping your dog’s focus and pretend like the bike isn’t there. If you are tense and nervous around the bike, your dog will pick up on it and be tense and nervous as well. The calmer you are, the better your dog will be. Don’t forget to reward calm behaviour with treats or their favourite toy! Montana is ready to head out on a little bike ride with Mischa to see what downtown Squamish has to offer. Training your dog in new situations is not a quick process. Continue working with them as often as possible. Your dog’s behaviour will regress if practice is not maintained. Once your dog is completely comfortable around bikes, try taking them out on a bike ride with you! Just remember that all trails are shared and full control of your dog is necessary to prevent injuries to themselves or other people. Mischa comfortably laying down in front of the bike after her training session. With spring transitioning into summer, there are many types of pollen and other allergens circulating throughout the air and environment. Many dogs and cats have seasonal allergy issues, just like us humans do. Allergic reactions can be brought on by both inhaled allergens and contact allergens. Dogs and cats show typically their allergy symptoms in their skin and ears. You may notice pets scratching or licking themselves more than usual this time of year. Having an itch you can’t get rid of can be very uncomfortable. You may also notice a funny odor coming from their ears. Often allergic reactions can be accompanied by bacterial or fungal infections that require medication in order to put a stop to the clinical signs. Some allergic reactions can be brought on by the food that your pet is eating. It is often difficult to narrow which ingredient your pet is allergic to. Your veterinarian may suggest trying a hypoallergenic diet for six to eight weeks. Allergy testing (via bloodwork) is available and very informative, but can also be quite expensive. Just as with people, allergies can be frustrating for your pet. Be sure to bring them in to see their veterinarian if you suspect they are having issues with their skin or ears. Treatment of allergies has a much greater prognosis if caught early. Your pet will give you a giant kiss to thank you! “Bernie” giving his mom a big kiss! Heat exhaustion can be fatal if not treated immediately. The weather is warming up out there – be extra careful with your dogs. If your dog over-exercises on a hot day or is stuck inside a confined space with no airflow such as a parked vehicle, they can suffer from heat exhaustion. Heat exhaustion occurs when the dog’s ability to regulate its body temperature is lost. Keep plenty of cool, clean water in a spill-proof container available to your pets. When outdoors, your dog may enjoy a baby pool filled with fresh water to lie in when it is very hot out. Bring pets inside, especially during the hottest hours of the day. Be particularly careful with senior and overweight pets as they have more difficulty regulating their body temperatures. Brush your pet’s coat to keep it free of mats. Do not shave off your pet’s coat completely because bare skin can get burnt in the sun. Fur protects your pet from the heat and insects and retains cooling water after a refreshing swim or wetting down from a garden hose. Exercise your pet during the cooler morning and evening hours. Avoid the hot pavement that can burn and blister your dog’s footpads. On hot, humid days, avoid jogging or running with your pet. Don’t take your pet with you when you head out to run errands. The temperature inside a parked car can kill a pet in a matter of minutes – even when you park in the shade and leave the windows cracked open. Keeping cool in the pool. Cooling off the footpads in the pool. Panting to cool himself down. If you suspect your pet is suffering from heat exhaustion, cool your pet down immediately by placing them in the shade and sponging or hosing them down with cool water (especially on the head, footpad and groin area). Give your pet small amounts of water to drink. If they drink too much water too quickly, they may vomit. It is recommended to have to your pet examined by their veterinarian if you think they are experiencing heat exhaustion. How many teeth does my kitten have? 26 deciduous teeth. How many teeth does my adult cat have? 30 teeth. How many teeth does my puppy have? 28 deciduous teeth. How many teeth does my adult dog have? 42 teeth. Why does my pet have bad breath (halitosis)? Bad breath usually comes from an overgrowth of bacteria in the mouth. Some bacteria can produce sulfur compounds as waste products, which produce an undesirable odor. How often should I brush my pet’s teeth? Once daily is ideal. 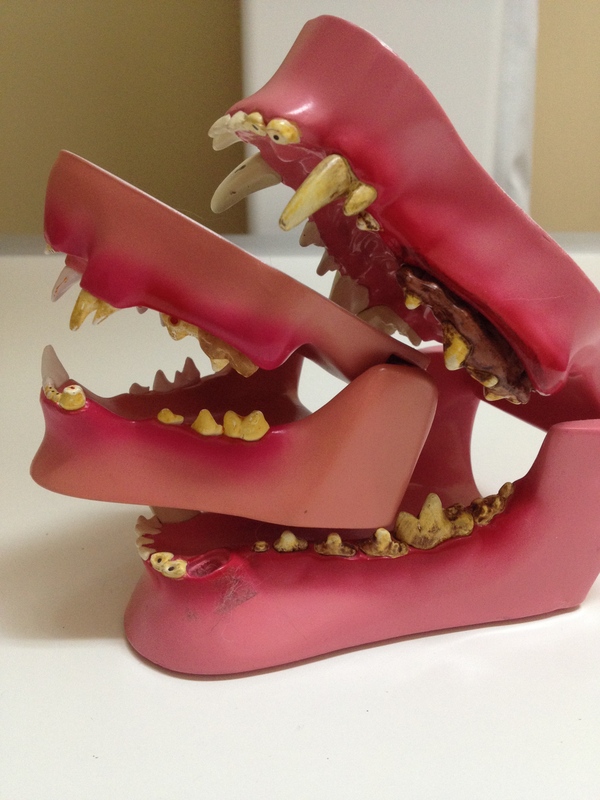 Can I scale my pet’s teeth at home? No, there is no way to effectively scale your pet’s teeth at home. While it may look like you are making a difference for the teeth cosmetically, proper and thorough scaling must be performed with the pet under anesthesia. Why is anesthesia necessary to scale my pet’s teeth? Non-anesthetic cleaning only provides a cosmetic improvement for your pet’s teeth. A proper dental prophylaxis involves a thorough oral examination, scaling and polishing of the teeth. Scaling is the process of removing tartar above and below the gum line (using an ultrasonic scaling device and hand scaling tools). Polishing is the process of “smoothing” the tooth surfaces after scaling. This makes the teeth more resistant to future plaque and tartar formation. Proper polishing of the teeth is very important and should always be performed following scaling. An awake pet will not allow their teeth to be scaled and polished properly, which may lead to even more dental disease issues in the future. Why does my pet need to have teeth extracted? Teeth often need to be extracted because of severe periodontal disease, abscessed tooth roots, fractures, resorptive lesions, misalignment, and other problems that may cause discomfort or difficulty chewing. My pet has both deciduous teeth and adult teeth in place. What should I do? This is a very common problem, especially among small breed dogs. The deciduous teeth must be extracted (if they do not fall out on their own) once the adult teeth have fully erupted to avoid future orthodontic problems. 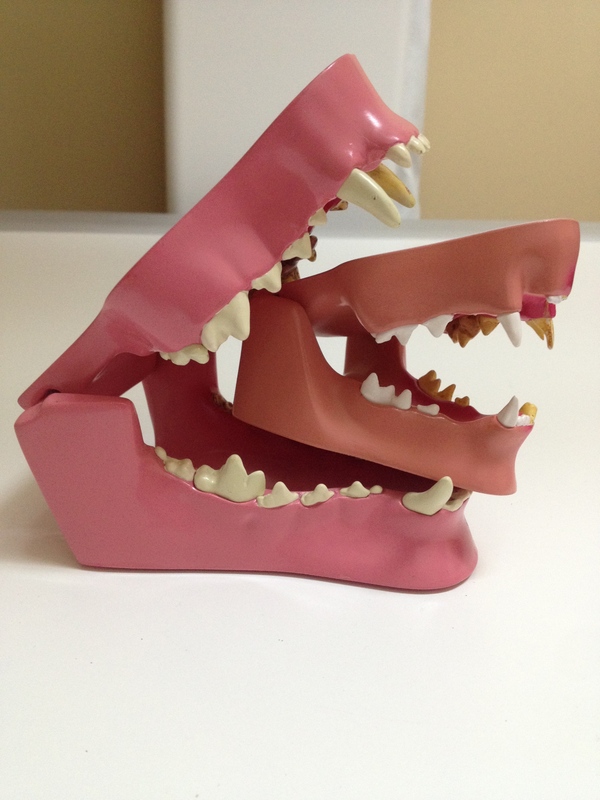 Cat mouth model inside a dog mouth model. Showing off the “dirty” side. Cat mouth model inside a dog mouth model. Showing off the “clean” side. Designed by Peak To Peak Marketing.